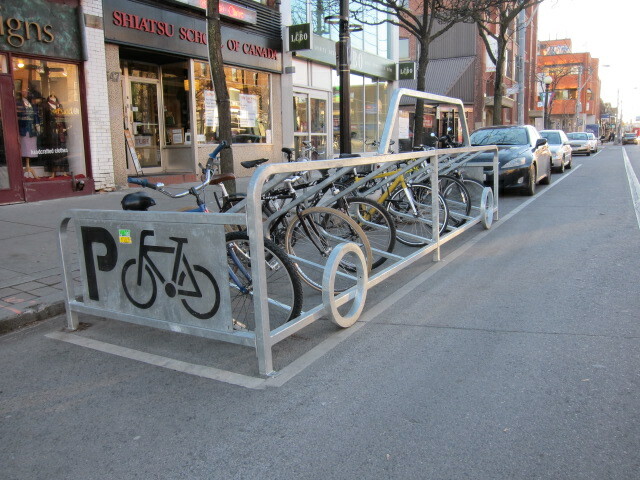 Photo of a bike parking corral on College Street next to the bike lane. Bike-friendly city councillor Mike Layton had it installed where there was once a car parking spot. What is the cost of free parking? Hint: The word “free” is used facetiously. On-street parking in Toronto still rules supreme, but why? Writer Albert Koehl examines the city's obsession with car parking. Cyclists have a long history and somewhat unhappy relationship with parked cars. It’s not just the painful meeting of car doors with flesh and bone that leaves a negative impression. It’s the fact that city politicians continue to favour parking over the safety concerns of cyclists (or the space demands of pedestrians). Fortunately, there is a growing body of evidence that upends traditional notions about the benefits of parking. Cars need an astonishing amount of space, and not just when they are moving. In Toronto a curbside or "on-street" parking spot officially measures 5.5 metres long by 2.2 metres wide – or 12.1 square metres (130 square feet). An “off-street” spot in a parking lot or garage takes up even more room because of access lanes, measuring around 31 square metres per space. Since cars, unlike transit vehicles, sit idle for 95% of the time a lot of urban space must be set aside in anticipation of a motorist's parking needs. U.S. research suggests there are up to eight (!) parking spots for each car. Using even half of that figure for Ontario means that the space dedicated to cars at rest exceeds the living space for many, if not most, humans. In the past, demands to re-dedicate parking to cycling or wider sidewalks were dismissed with smug answers about the value of parking, especially curbside spaces, to local businesses. A generation of civic leaders and planners championed the parking spot at the expense of other road uses. It's clear these "champions" have never read UCLA urban planning professor Donald Shoup's 650-page text The High Cost of Free Parking, first published in 2005 (and recently released in paperback) – otherwise they might already have adjusted their value system. Shoup’s title summarizes his thesis: “free” parking comes at a very high cost to the community due to excessive car use, disfigured cityscapes, and missed opportunities for better use of land. The word “free” is used facetiously. The full cost of parking is always paid, but usually not directly by the motorist. When parking does carry a direct cost it’s often under-priced. The real cost of driving is hidden, encouraging more car use. Ironically, non-motorists who don’t want or can’t afford cars end up subsidizing car owners in places like grocery stores because parking costs are hidden in purchase prices. Zoning laws usually require buildings to have a minimum number of parking spots. Shoup says these requirements are commonly established by shabby research and based on the demand for free parking during peak or near-peak times. Shoup’s recommendations are simple. Let the market decide how much off-street parking should be provided; always charge market prices for curbside parking to ensure supply slightly exceeds demand (to avoid wasteful “cruising” for parking); and return curbside parking revenues to local communities. Our advocacy group, Bells on Bloor, recently did an inventory of parking in our own downtown Toronto neighbourhood. In a 15-block area along Bloor Street running west from Spadina we counted all parking spaces open to the public. We counted parking on side streets in the first full block starting from Bloor, in adjacent paid lots, and on Bloor itself. Here’s what we found. On side streets there are at least 650 free parking spots. (The spots are reserved for residents only from midnight to 7 a.m.) There are over 550 paid parking spots, mainly in municipal lots. On Bloor itself, there are a relatively modest 150 metered spots on the north side of the road, and another 100 on the south side. Our counting wasn’t motivated by mere curiosity. Bloor Street–Danforth Avenue is a popular cycling route, despite the lack of bike lanes. A 1992 city report identified Bloor-Danforth as an ideal east-west route. The call by advocates to trade some on-street parking for improved cycling safety has always been brushed aside based on the apparent über-importance of parking. Our inventory shows there is abundant, including free, side street and off-street parking to accommodate both motorists and a bike lane in our area. It isn’t just Shoup who has helped debunk myths that treat parking as irreplaceable, and the safety of cyclists as irrelevant. Two studies by the Clean Air Partnership (CAP) along Bloor confirmed that merchants routinely over-estimate the contribution of motorists to their businesses. In one study, which included part of our inventory area, CAP found that only 10% of shoppers arrived by car while cyclists and pedestrians spent the most each month. It turns out that the people on bikes are more important shoppers than the people in cars. Similar reports from several U.S. cities show a range of community benefits from investments in improved pedestrian or cycling conditions like increased business for local merchants, higher housing values, and lower vacancy rates. It’s clear that our city's love of parking is not what’s best for the community, or for business. The new evidence should convince some municipal politicians to become champions of pedestrians and cyclists, instead of the parking spot and obsolete thinking. Albert Koehl is an environmental lawyer and founding member of Bells on Bloor. He was on the expert stakeholder panel for the Ontario Chief Coroner’s recent pedestrian death review. That statistic does not prove who is more important to a business, at all. Someone arriving by foot isn’t automatically more important, even if there are three times as many arriving by foot. What would be more important in this scenario is who actually spends more money. A motorist or a bicyclist? My personal observations are I spend about $25 on groceries when I arrive by foot and can easily spend $100-150 when arriving by car. I do go more frequently by foot, though, too, but that $150 trip usually is for 3 days vs a daily $25 trip. But you can easily see why this whole point of the basis of this argument is moot.